This blog follows the ongoing adventures of Naomi and Nathan Beckord on the sailing vessel "Hurulu", a well-found and very beautiful Islander 36. As Naomi posted, we successfully made it to San Diego! It's been something of a blur...the days prior to setting sail were frantic and frenetic, filled with packing all non-sailing vestiges of our life into a 5x7 storage unit, tearfully handing off the dog, freezing our credit, transferring funds, and about 2,342,321 other trivial but necessary tasks. We had a brief moment to catch our breath on October 14th when many good friends came out to a little bon voyage sunset happy hour, most bearing either a mix CD or a bottle of some sort (underscoring the well-established connection between sailing and drinking). 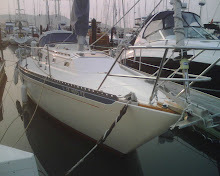 Finally, on Wed the 15th at the ripe early hour of 5 am we cast off the dock lines, motored past Tom Perkin's Maltese Falcon (roughly the length of 8 Hurulus) and cruised under the GG Bridge. With the sun just starting to rise over the City, we enjoyed a symbolic, serene, and picture-perfect moment (somehow sans pictures). The central California coast is really empty: It’s amazing that in a state this crowded, the coast between SF and Pt. Conception is almost completely empty. We sailed for about 2 days without seeing another human. You get a sense of this when driving Highway 1, but the effect is magnified when 20 miles off the coast. If you ever want to truly ‘get away from it all’, get in a small boat and head west. SoCal is much more beautiful from the sea: After tying up in Santa Barbara Harbor for a nice rest, Brian took a train home and Naomi and I sailed amongst the islands of SoCal for another 3 days. Despite the presence of roughly 10 million souls due east of us, passing through the islands we saw maybe 5 other boats. The islands themselves are rugged and beautiful, and we’re hoping to spend some time at each on the way back up. Being captain is hard work: Since I have the most experience, I am defacto captain of the ship. Mainly, this means worrying about things…how the sails are set, what the oddball clanking noise means, whether the diesel fuel filters are doing their job. It’s exhausting work, and it makes it rather hard to fully relax, but “Captain” does have a nice ring to it…if only I had a proper Captain’s hat. Bill was worth his weight in gold: we hired a guy named Bill to do lot of prep work on Hurulu before our departure, and his efforts became apparent as soon as we were out at sea. Any boat—but especially a 30 y/o boat—is a complex piece of equipment, but he literally went through it bow-to-stern. The only equipment issues we had were a failed winch and a broken lifeline, both of which were easily repaired. Our Coast is Guarded by kids: Coming into San Diego at 3 am, a boat suddenly zoomed out of nowhere and within minutes we had 3 teens on board making sure our fire extinguishers were up to date and that no Mexican immigrants were hiding in our head (bathroom). We were exhausted and delirious and it was altogether a surreal moment, but we passed their exam with flying colors. Dolphins are really cool: Several times on the trip, we were joined by pods o f dolphins who would suddenly circle the boat and surface on all sides, then dive and zip underneath. They would do it day and night….why they do it I don’t know, but needless to say it’s very cool, and it breaks up some of the monotony of being on the ocean. Ok, that’s it for now. We are presently in the process of provisioning the boat for our next leg of the journey, to Cabo and points beyond…stay tuned! 6 days and 551 miles later, we made it to San Diego! It was a slow trip, light winds and lots of motoring. We are happy to be in the sunshine after the chilly coastal passage, and catch up on sleep after 6 days of 3 hour shifts. The coast was beautiful--we saw a whale, a shark, and dolphins galore. Stopped at a lovely harbor in Santa Barbara for a night where our trusty crew Brian left us, then Nate and I made the last 150 miles to SD solo. As we closed in on SD, in the dark of night, an unlit boat sped toward us on a collision course--turned out it was the coast guard, which boarded us and checked us for safety compliance. Hurulu did great, and we'll spend the next few days preparing for our trip to Cabo. It's 6 days and counting until we cast off, so I've been turning my attention lately to the weather buoys that line the California coast. If tuna is the chicken of the sea, buoys are the stock market. They can be closely monitored, conditions change rapidly, and the fluctuations provoke in turn alarm and relief. The amount of data one can access about wind, tides, and current in real-time is pretty staggering--my favorite buoy site is www.buoyweather.com-- at which I've got my eyes on the buoys outside the SF gate and off point Concepcion. The last few days have been pretty intense--yesterday Pt. Concepcion was showing gale force wind and 18 foot seas-- but things appear to be calming down a bit. Now if only we could say the same for the market..
We haven't even cast off the dock lines yet, and already my heart pangs at the thought of leaving behind my best brown friend. Ever since we brought this animated plush toy home 4 years ago, he has been a constant companion; he is literally at my side almost all of the time. Dogs love routine, and our days follow this pattern: Naomi is sitting at the dining room table, working. I let Finney out of his crate with a hearty "Good Morning" greeting. He runs between my legs and then jumps up on her lap, wagging his tail furiously and slapping his tongue everywhere. I've never seen such enthusiasm to start each day, and it never waxes or wanes...it's consistently jubilant every time. Next, we walk down the hill to the office. On the way, we stop at the La Taza cafe to pick up an extra large coffee. I park him outside the door, without tying him up, and he sits there motionless, intensely waiting for me to come out. Mind you, this is right off Union Square, so crowds are milling about. The European tourists, in particular, are impressed that he sits there without restraint and ignoring all distractions. While at the office, he positions himself under my desk and falls asleep-- usually just in such a spot that I have to scoot my chair back and stretch to reach the keyboard, making for some awkward ergonomics. When the work day is done, we go home, make a meal, and watch some Netflix. He lays on the couch next to me, rests his head on my lap, and falls asleep. Occasionally he snores. Finally, we go to bed. And yes, when Naomi is traveling out of town, he sleeps next to me. But he's really not a sailor. 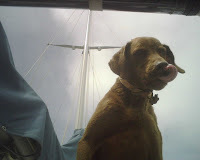 So it is going to be excruciating when we set sail next week and my brown buddy will stay behind. I am comforted by the fact he'll be with some of his favorite people on earth, Ali/Cooper and the Skaggs (gretch, you reading this?) and will be well cared for. Nonetheless, I think I will soon learn what a siamese twin must feel following a successful separation operation. I may inadvertently reach down to scratch his head, and feel nothing but air. 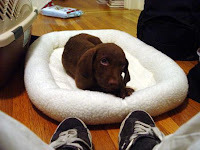 Do you think I could get Naomi to curl up at my feet for an hour or two?